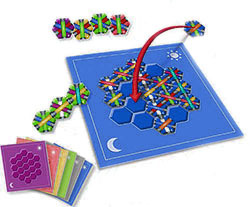 Before playing for the first time, carefully push out the hexagonal tiles from the punched boards. 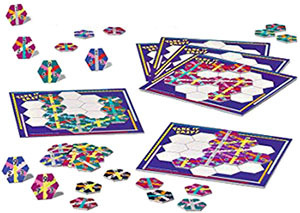 Each player takes one game board and the set of tiles in the matching color. Decide which player will be 'caller'. 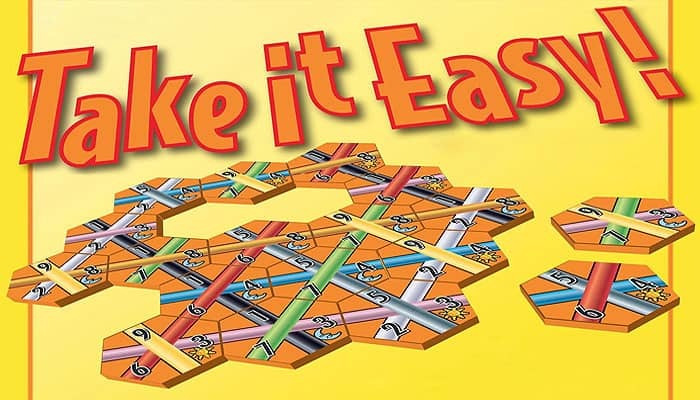 This player turns his/her tiles face down and mixes them thoroughly. All the other players then place their tiles face up and organize them into three groups according to the top number (1, 5, or 9) to make it easy to locate the tiles when they are selected by the caller. Please note that the individual tiles are marked with either "suns" or "moons". These symbols have no significance when playing the 'standard' game of Take It Easy!, and can be regarded as being for decoration only. However, at the end of this rulebook, several game variants are suggested, in which the sun and moon symbols are used. The caller selects one of his/her tiles at random, turns it face up, and announces the three numbers on it. All the other players locate the same tile from within their own set of tiles. Every player, including the caller, now places this tile on his/her own board. After all players have placed this tile, the caller selects the next tile. Play continues in this way until the boards are all filled with tiles. The tiles must always be placed so that the numbers are upright (as though you were reading them from a page). Tiles may be placed in any empty space anywhere on your playing board. Only one tile may be placed on any one space. Once a tile has been placed, it cannot be moved. As the game progresses, you will find that you will not be able to match all the stripes on the tiles you are placing with those in existing rows. However, each tile drawn by the caller must be placed by every player. After the 19th tile has been placed and all players' boards are full, players count their scores. 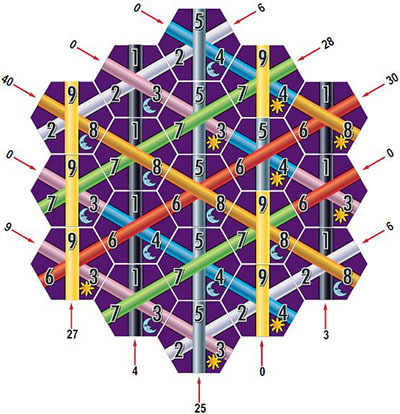 Players can score points for each row on their playing boards in each of the three directions: vertically, diagonally from the bottom left to top right, and diagonally from the top left to bottom right. Points are scored for rows containing stripes of continuous color. The stripe within such a row must run from one edge of the board to the other without any change in color. These rows are referred to as 'Scoring Rows'. If there is even one tile in a row containing a stripe of a different color, then that whole row will score no points (i.e. it will not be a Scoring Row). For each Scoring Row on your completed playing board, multiply the number of tiles in the row by the value of the stripe's color to get the score for that row. Please see the examples provided on the next page, just below the diagram in the section entitled "an example game". The player who has the highest final score is the winner of the round! 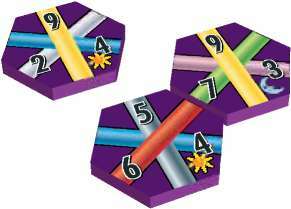 Games can be played as a single round, or as a series of rounds where each player takes a turn as caller, and where the scores from each round are added together to make a cumulative running total. The following illustration shows the scoring in an example game. The maximum possible score when playing standard "Take It Easy!" is 307. There are sixteen different ways of doing this. One example is displayed on the back of your game box.